Seriously, they're as nostalgia-inducing as their heads are massive, by which I mean to say they're incredibly nostalgia-inducing. But look how cute they are! It's almost like a cheaper Nenodroid-style figure, how cute! 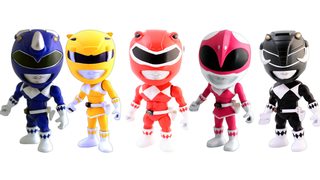 The first series has the 5 primary rangers, the White and Green Rangers, as well as villains Rita Repulsa, Lord Zedd and Goldar. As someone who grew up in the midst of Power Rangers mania, it feels like these little blighters are laser guided to the nostalgia centre of my brain. Alas, the extra articulation and all the accessories means that each figure is quite pricey - at $14 that's quite a chunk of cash to throw down on something where you it's random as to what you're getting in each box. That probably won't stop me though, because I am, of course, crazy/an idiot/both.